“Dead Palestinian” killed by “unprovoked Israeli attacks” with crying and wailing family members around him, walks off perfectly healthy after the cameras stop rolling. Arab propaganda about the Isarel-Palestine conflict is filled with Taqqiyya; the deliberate and intentional lying to the non-Muslim world. Taqqiyya is part of Islamic teachings. The problem with Pallywood, the Palestinian PR machine, is that it violates international media regulations by flooding the world’s press with distortion and outright fraud by the Palestinians and other Arabs. 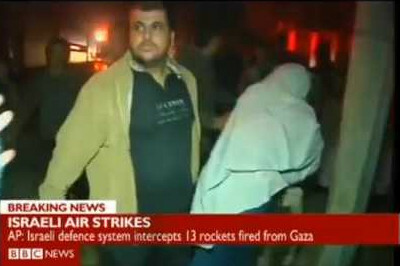 Pallywood is infamous for fake photographs and news reports of ‘Israeli attacks’ that never occurred, and ‘dead Palestinians’ who only minutes later walk away once the camera is off. The word Pallywood was coined by Professor Richard Landes. In 2005, Professor Richard Landes of Boston University produced an 18-minute online documentary video called Pallywood: According to Palestinian Sources. Landes and pro-Israel advocates argue that the Israeli government is insufficiently robust in countering Palestinian accounts of events in the Israeli–Palestinian conflict. In his video, Landes shows Arab-Israeli conflict-related footage that was taken mostly by freelance Palestinian video journalists. He argues that systematic media manipulation (which he dubs “Pallywood”) dates back to at least the 1982 Lebanon War, and argues that broadcasters are too uncritical of the veracity of Palestinian freelance footage. Press regulations state that the media is obligated to provide accurate and undistorted facts about news and events. Due to the massive volume of Pallywood publications seen in our media on a regular basis that are completely fraudulent, even the major media outlets such as CNN, Fox, BBC, NBC, 60 minutes, and other agencies around the world have been unwittingly violating press regulations and flooded the public with Palestine propaganda rather than factual and truthful news. The short time frame between breaking news and publication, added with weak verification sources in Arab territories have made verification of accuracy difficult for the press. Pallywood is not restricted to the Arab propaganda against Israel, but has also been used in conflicts in Syria, Egypt, Lebanon and so on. : But pro-Israel media-watchdog advocates have gone further, arguing that the footage is a prime example of what has been dubbed “Pallywood” – media manipulation, distortion and outright fraud by the Palestinians (and other Arabs, such as the Reuters photographer caught faking photos during the Second Lebanon War), designed to win the public relations war against Israel. ^ a b Carvajal, Doreen. “The mysteries and passions of an iconic video frame”, International Herald Tribune, Monday, February 7, 2005. ^ Landes, Richard. “Pallywood: History”, SecondDraft.org. ^ Zerbisias, Antonia. “And Now It’s Reutersgate”. Toronto Star, 9 August 2006. ^ Gelernter, David. “When pictures lie”, Jewish World Review, 2003. ^ Photo of Palestinian Boy Kindles Debate in France, The New York Times, 7 February 2005. ^ Frum, David. From Gaza, tragedy and propaganda. National Post, 17 June 2006. ^ Michael Doxtater, “How the Mohawks look at history”, Globe and Mail, 11 July 1991, A17; “Mail bombs spark public warning”, Kitchener-Waterloo Record, 20 July 1995, A3; Geoff Baker, “Who’s behind mail-bomb plot?”, Toronto Star, 30 July 1995, A2; “Tamils protest paper’s story”, Toronto Star, 13 February 2000, p. 1; Rob Faulkner, “Institute offers anti-terrorism tip sheet”, Hamilton Spectator, 10 August 2005, A6. ^ Lies, Damned Lies and Footage, The Mackenzie Institute, Newsletter July, 06. ^ “The Fog of Peace”. American Thinker. Retrieved 2010-07-28. ^ “FrontPage Magazine”. Frontpagemag.com. Retrieved 2010-07-28. ^ Malkin, Michelle (2006-12-05). “Questioning a NY Times reporter; challenging CBS News & ASNE”. Michelle Malkin. Retrieved 2010-07-28. Landes, Richard. “Al-Durah: What happened? (video). “And now it’s ‘Reutersgate’,” Toronto Star, August 9, 2006. (German) “Wie Palästinenser manchmal die Wahrheit verbiegen”, Israelnetz, June 19, 2006. Cambanis, Thanassis. “Some Shunning the Palestinian Hard Stance,” The Boston Globe, September 6, 2005. Gordon, Philip H. & Tasponar, Omer. “Why France shouldn’t legislate Turkey’s past,” The New Republic, October 30, 2006. Kaplan, Lee. “Some PLO doctored photos: A visit to ‘Pallywood'”, Canada Free Press, May 28, 2006. Kaplan, Lee. “Pallywood revisited: A new fake atrocity by the PLO”, Canada Free Press, June 24, 2006. (German) Von Wussow, Philipp. “Israelische Bomben auf Kana: Massaker oder Hisbollywood?”, Telepolis, August 3, 2006.
we need an action item as “crying” won’t help. _ how to attack back the BDS Muslims? ?